Welcome to Simantro Beach Hotel. For those who demand great service, beautiful surroundings, fabulous weather, non-stop entertainment, delicious food, absolute comfort, peace and quiet as well as fun and games, Simantro Beach Hotel is an ideal proposal, located just a few steps off the sea, surrounded by a pine-tree forest! The uniqueness of Simantro Beach Hotel lies in the similarities of structure and beauty to the remarkable and timeless monasteries of Mount Athos. Built in 1992 and extended in 2000, it has numerous Byzantine elements and fine details in wood and stone, setting this hotel apart form all others. 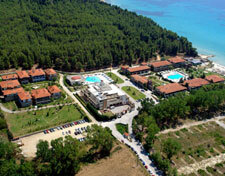 Situated on the northwest side of the Kassandra peninsula, the hotel operates 175 spacious rooms from April to October. A restaurant and an "a la carte" taverna offer our guests a variety of delicious foods. Guests aged between 25 and 45, both single and with families are our main guest profile. Simantro Beach Hotel is for anyone who wishes to spend their holiday relaxing and enjoying the sea, sun and, of course, the excellence of traditional Greek food. Our animation team is ready for fun every day from 10:00 till 23:00. During the day, guests can take part in athletic activities. They can also enjoy various games that are organized. During the evening, children can exercise their dancing skills in our mini club and the adults can watch the evening animation program which includes sketches, shows, competitions and games. During the day, our young guests can take part in the activity and fun program that our animators supervise. In addition to all this, we should mention our Greek evening once a week, where folklore dances take place. Many sport facilities can be found on our beach. Wind surfing, jet ski, water ski and also canoes, bananas, ringo and balloons are available. For those who seek adventure, we suggest a few lessons at our diving center. Those who want to exercise can do so by using our tennis courts, the beach volleyball field, and the table tennis. Possibilities for mountain biking and trekking are available.